Every year, I pretty much post the same thing. Today is Veteran’s Day – go out and thank a vet. This year, I’d like to include yet another picture of my father and me with him in his uniform and one of Mom and me and tell you a story. Last night, I was in Mo’s Irish Pub in downtown Milwaukee with my beautiful wife. We had stopped for a drink while waiting for the doors to open to see Wanda Sykes at the Riverside. When we walked in, I saw a Marine in his dress blues. I tapped him on the arm and when he turned, I held out my hand and thanked him for his service. He thanked me and actually kissed my hand. Wow! That was cool! Then, after we were served at the bar, I saw a man in an Airbourne hat. I excused myself from Cheryl (who is used to this) and thanked him for his service. He said “If I knew I would be thanked by a beautiful woman, I’d do it all over again!” He made me giggle and was rewarded by a kiss on the cheek. It was a great night for me. You don’t and you shouldn’t wait for Veteran’s Day to thank a Vet. You should do it all year long. And, let’s go further. Let’s thank their families as well. Quite honestly, I don’t remember much about my father’s service. I have bits and pieces in my head. I remember his absence more than anything. How he missed out on a lot to serve his country. It couldn’t have been easy for my mother to raise first me, and then my younger brother showed up, all by herself. Military families serve as much as their service member does. So, when you see a Vet, thank his wife or her husband. They do a lot for our great country, too. God Bless our Military for without them, we probably wouldn’t be speaking English. 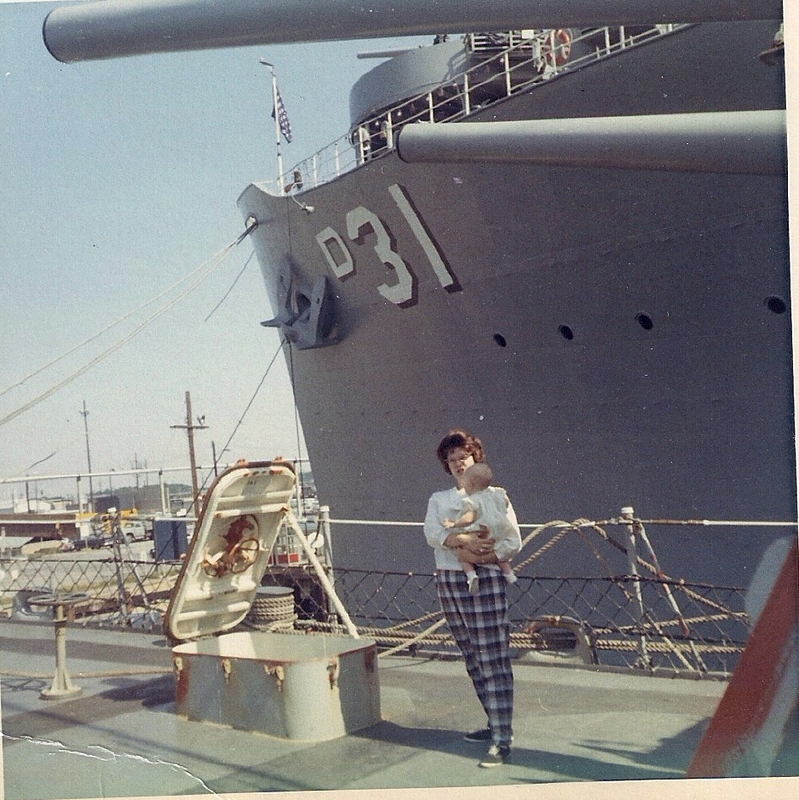 I’ll have to ask my mother, but I think this is a picture of us dropping Pop off at his ship in 1968. Unfortunately, I couldn’t find one of Pop and me or Pop and all of us. I don’t know if we took it or not. I think that might be the Owens, but I’m not sure. 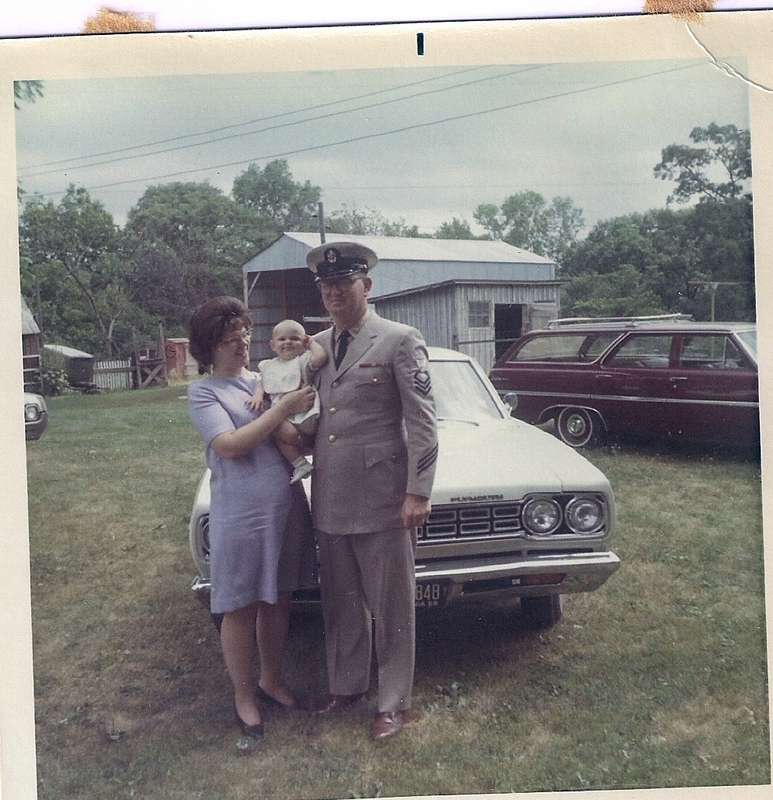 This is a picture of my mother, me and father in 1968. It doesn’t matter where you are when you do so. If you see a soldier, Marine or sailor in uniform, shake their hand, look them in the eye and thank them for their service. If you see someone in a hat that says veteran on it, do the same thing. These men and women put their lives on the line for us. They serve their country with honor and for little pay and benefits. Their families live with the separation of war and service and they’re rarely thanked. Remember this: If you can read this, thank a teacher. If you can read this in English, thank a vet. Today is Veteran’s Day and, because I like this post I wrote on Memorial Day, I’m re-running it. In fact, I think I’ll re-run it on every holiday where we honor our servicemen and women.